If you read my last post, you'd know that I've been having a hard time with all the hateful rhetoric going around these days, never mind the actual violence. I decided to really make a point of searching out and focusing on the LOVE that I know exists in everyone, and talk about that instead. When you make these choices, the world seems to arrange itself accordingly. 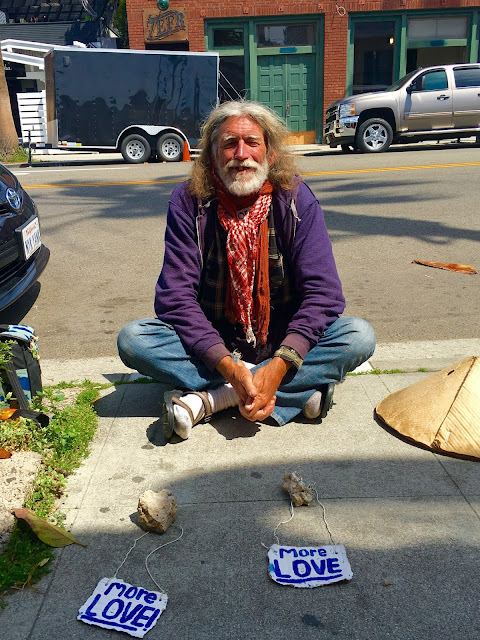 Like when first thing this morning I saw David Busch sitting on the sidewalk in front of Mystic Journey on Abbot Kinney, offering "Free Love" to anyone passing by. Well, I of course took him up on not only a "More Love" piece (which is a "command"), but also the chance to sit down on the curb there with him to hear what he had to say about the state of our city and country's affairs these days. I asked what he'd been up to lately, and he simply replied, "Love". Awesome. We discussed the homeless "problem" here in Venice, and the only problem he sees is the persecution of people by authorities simply because they can't afford a proper house - because of an affordable housing crisis here in Venice that we all feel. He considers the sweeps on the homeless down at the beach a form of terrorism, and so do I. It's all about fear, and we both cannot understand why people who need the most help in one of the richest cities in the world, really aren't getting barely any. We talked about Venice being a "Cultural Wetlands" - which I loved - and how it's biodiversity of both people and creativity are being severely endangered ... and how we'll both fight to preserve it. This will all be discussed in depth tomorrow night at the Venice Neighborhood Council meeting held at Westminster School at 7 p.m., where they will attempt to come up with "Homelessness solutions." David Bush will be there, perhaps with the best solution of all ... More Love.